Although Cecile Moss lived in Old Montague St for fourteen years, this is the only photograph taken of her in Spitalfields, and it was taken for a precise purpose. 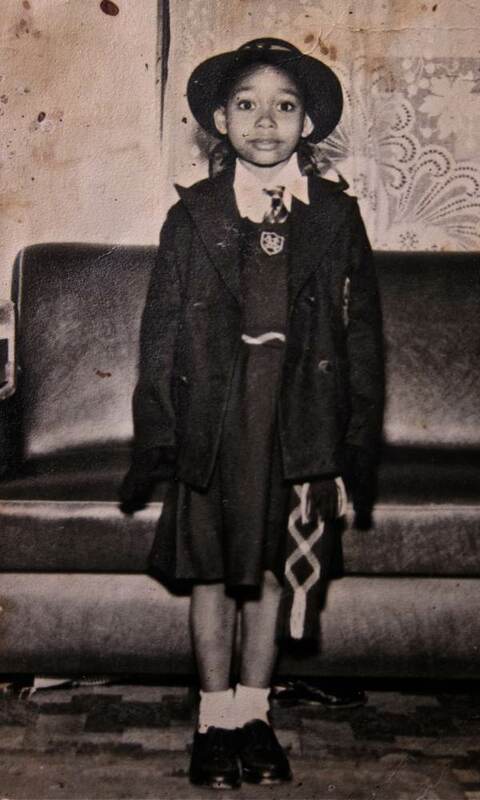 A photographer came round to take it in 1955, the year Cecile arrived from Jamaica aged four years old, and the picture was sent back to her family in the Caribbean as evidence that she was attending a proper Catholic school with a smart uniform and therefore all was well in London. Yet in contrast to the image of middle class respectability which Cecile’s mother strove to maintain, the family lived together in one room in a tenement and the reason there are no other photographs is because they had no money for a camera. 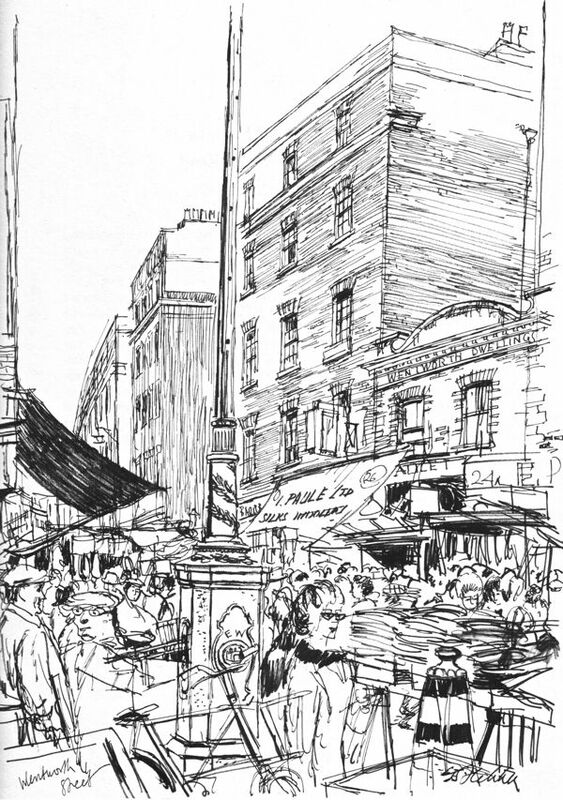 Almost no trace survives today of the Old Montague St that Cecile knew – a busy thoroughfare crowded with diverse life, filled with slum dwelllings, punctuated by a bomb site and a sugar factory, and lined with small shops and cafes. There, long-established Jewish traders sat alongside dodgy coffees bars in which Maltese, Somalis, Caribbeans and others congregated to do illicit business. In fact, Old Montague St offered a rich and stimulating playground to a young child filled with wonder and curiosity, as Cecile was. “We came to England from Jamaica in 1955, me, my sister Clorine and my mother, Marlene Moss, to Old Montague St in Spitalfields. She left my father and came over to live with her sister, Daisy. I was four years old and I didn’t know I was coming to England, I was traumatised. But I remember what I was wearing, I wore a double-breasted coat with a velvet Peter Pan collar and lace-up shoes. My mother was a teacher in Jamaica and she didn’t want us to look like refugees arriving in England. The voyage lasted ten days and we were met by my uncle at Southampton. It was very confined on the boat so that when I got off, I kept on running around. We lived in a building where the Spitalfields health centre is today. We were 9b, above a shop where two elderly Jewish sisters lived. My mother cried for days because we had to share one toilet with three other floors, so it was really quite disgusting. I was told that I had come to get a doll. But it was an ugly chalky-skinned blond doll, and I was so angry and upset that I threw it away and smashed it, which made my aunt think I was a very ungrateful little girl. My mother,my sister and I all lived in one room. My sister was eleven and she remained silent, whereas my mum and I just cried a lot. I missed my family in Jamaica. I went to St Patrick’s school around the back of St Anne’s and my sister, because she had already passed the eleven-plus, went to Our Lady’s convent in Stamford Hill. Yet I only lasted two weeks at St Patrick’s because the kids hit me and pushed me over. I can’t remember if they called me racist names, but I know I was terribly unhappy. My mother took me away and sent me to Stamford Hill too. I was five years old, and she put me on the 653 bus and told the conductor where to let me off. The people on the bus would look after me and I never missed my stop. I felt safe. So we lived in the East End but we went to school in North London. That was unusual but, because my mother was a teacher, we were middle class, even though we lived in Old Montague St which was a slum. Old Montague St had quite a reputation for drugs. There were dark tenements with dark passages with dark dealings. When my mum got a permanent job at St Agnes’ school in Bow, she took me away from Our Lady’s at seven years old. So I never went back to school in Spitalfields but I used to play out on the street a lot. Most of the children I played with were second generation Irish with names like Touhy, O’Shea, Latimer and Daley - that’s who I grew up with. There was an older Irish boy who looked out for me, he said I was part of the gang. He told us we mustn’t speak to the people on Brick Lane because they were Jewish. He was looked after by his grandmother. She was a character. Every Saturday night, she went to the pub on the corner of Chicksand St and filled a jug with port or whatever and stumbled back singing, ‘Daisy, Daisy give me your answer do.’ And my mother cried and said, ‘Look what we have come down to.’ One day, the old lady, she tied a skipping rope across the street to stop the traffic so that we could play. When the police came along, she said, ‘The children have got nowhere to play.’ And we were all shocked, but later they opened a playground on the corner of Old Montague St and Vallance Rd. I loved going to Petticoat Lane. Every Friday, my aunt would go and get a chicken – you could choose one and they would kill it for you. There were street entertainers, an organ grinder and man who lay on a bed of hot coals. 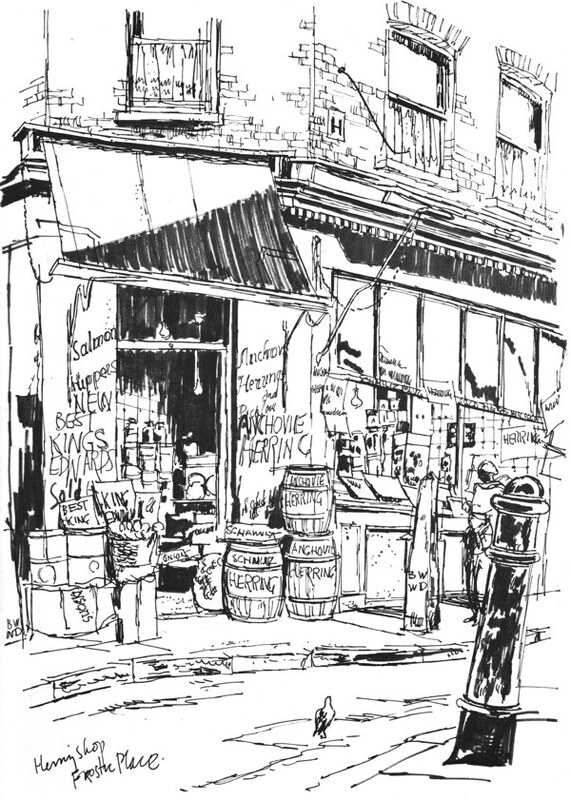 Walking up Wentworth St, there were all Jewish shops with barrels of pickles and olives outside. I was fascinated but my mother said, ‘That’s not our food.’ A lot of the stallholders were quite friendly to me and my mother because they thought we were the next wave of immigrants. There was a cafe I walked past with my mum, it was full of black-skinned men but I couldn’t understand what they were saying even though they were like us. They were Somalis. The men outside, they’d give me sixpence and put me on their knee. They liked to see me because they were away from their own children. 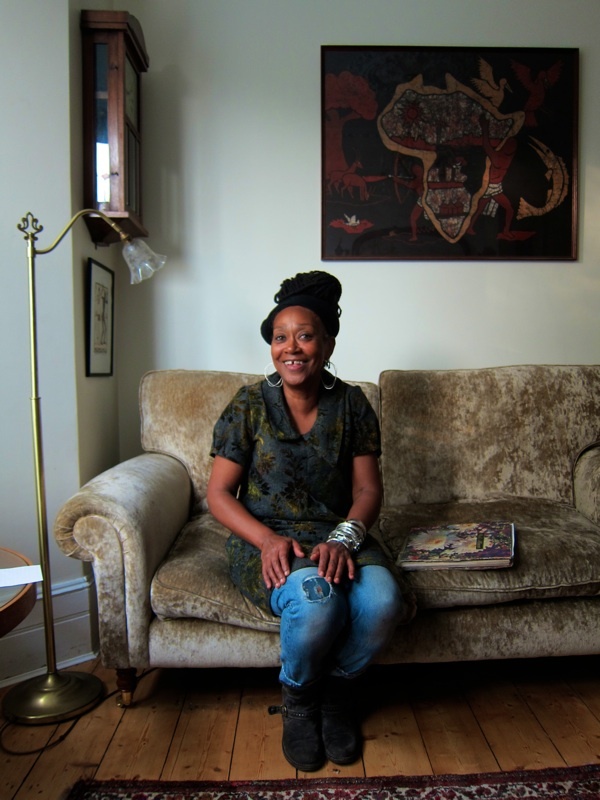 I think we were some of the first West Indians here, there were no other black kids. I spent a lot of time in the fleapit cinema on Brick Lane on Saturdays. But by the time I turned seven, my mum stopped me playing out. She forbade me, so my wanderings around Spitalfields stopped and I don’t mix with the kids on the street anymore. Instead I became more friendly with the kids I was at school with in Bow. My aunt Daisy went back to Jamaica and my sister returned when she was eighteen. So it was just me and my mum in the end. We shared a bedroom and we had a sitting room, with the kitchen in the hallway. I was very embarrassed about where I lived and I didn’t bring friends home because it was a slum. All this time, my mother was not divorced, she was still married and it really held her back. She even had to ask a friend to his name down for her to be able to buy a television. There was a hardware shop and other shops run by Jewish people, where they got on well with my mother. There was a bit of snobbishness because she was a teacher. It used to cushion me too, I was Mrs Moss’ daughter. When she complained, they used to say to her, ‘Never mind, we had it, now it’s your turn.’ Referring the racial prejudice, they meant it was something you put up with, then it would pass. And by the time I left Spitalfields, it was the Bengalis coming in, so it was quite profound what they said – it was a rite of passage at that time. When I was eighteen, we moved out. Looking back on it, I’ve got to say it was a happy time. I knew when I’d forgotten Jamaica and made my transition to England. I played a lot on the stairs and I pretended to have a ‘post office’ there. One day my mother was there too, washing some clothes on the landing and she corrected my speech. ‘It’s not ‘spag-ETTEE,” she said, ‘It’s ‘spaghetti” And, I realised then, that was because I’d left Jamaica behind and I spoke Cockney. I feel the tales of immigrants are so rich and at times almost unbelievable. I was five when I arrived in London, without a word of English and very disorientated. I can identify wholly with Cecile’s experiences. I find it very touching that you are recording these important social histories. Really fascinating post. 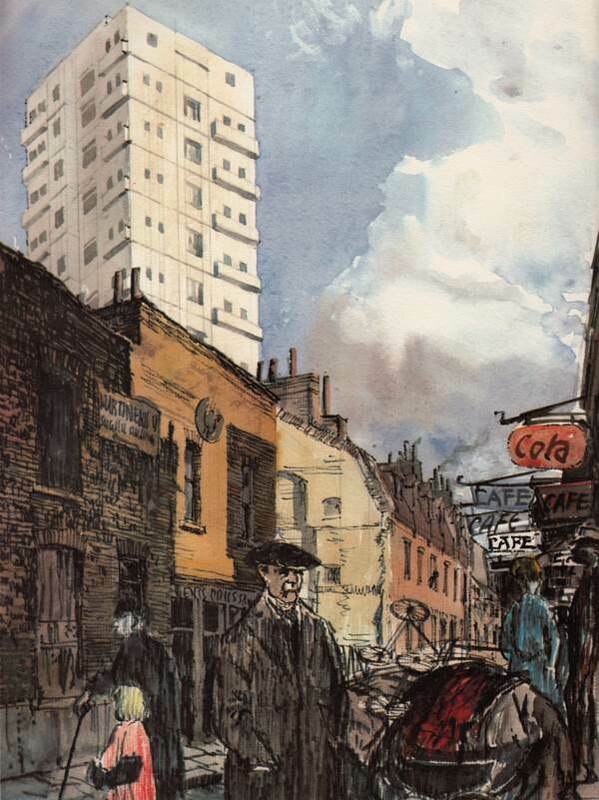 And, I agree with the above comment, it seems almost unbelievable to hear about how slum-like the East End used to be and the stuff new immigrants went through – like something from a very distant time. Cecile looks fantastic for 60. In fact I thought she was about twenty years younger, if not more. i love to hear the stories of how the children, themselves, coped. one cried, one didn’t. the irish boy protected her until her mother wouldn’t let her play in the street any more. the somali men missed their little girls. and now as a teacher herself she passes the understanding on. I remember Cecile from St Victoires Convent grammar school. In 1965 we went to Switzerland with the school. I have a photograph of some of the girls including myself and Cecile. I’m so pleased she is doing well. I remember Cecile from St. Victoires School. She’s younger than me but I remember her as she was a terrific runner and good at most sports . I was always jealous as it was either her or Lizzie Brahams who won the sprint races!! She was also in the netball team. Amazing piece! Not only for the content, but for the memories evoked. I too remember Cecile from St Victoire’s although she was younger than us – she still looks the same. As Kate Buckley (Madden) says she was a terrific athlete and if she wasn’t winning then Lizzie Braham was. Kate wasn’t a slouch at the running game either. I seem to remember her breaking her collar bone (Kate that is) at one school sports day. I was also on the school trip to Switzerland that Jean Sullivan (Folkard) mentions and also have photos to prove it. Kate and I were great mates at school and after, but we lost touch – would love to catch up. If you see this Kate, do you remember going to a college for ‘BookcReeping and AccRounts’ . The teacher (a Mister Greensomething as I remember) had trouble pronouncing the subject properly which caused endless mirth. Margaret Jordan used to go with us. Jean and I and Cherril Martin got together for a while after we went to a St Vic’s reunion a few years back. Then I moved away from London and we lost touch again. I am Una Barry, and Mrs Moss was my very first teacher at Primary School in 1958. She taught me how to read and write, and can still see myself there with a little blackboard the size of today’s smaller laptop, copying out the No 2 until the board was filled. If she approved, then onto No 3, and Janet & John Books to learn how to read from. Cecile Moss I thought was at St Agnes’s School in Bow and I think older than me, but I remember her as a great runner and particularly when we had sports days in Fairlop and in Victoria Park. I went to St Victoire’s from 1964 to 1971, and then went on to music college to become a classical singer. My mum was the church organist at St Catherine’s after Sr Damian, who was the next class up from Mrs Moss, left to be sent to a different convent -Homerton to Colywn Bay I think, or she might have gone to Hillingdon in between times. My brother’s middle name is Damian, and my parents chose that name in tribute to Sr Damian.